PICTURE THIS: A GROUP OF SENIOR CITIZENS GATHER IN A ROOM, mingle over drinks and snacks, and then find their seats at one of the many small tables, one man and one woman at each. They have five minutes to talk, to learn each other’s names and interests and backgrounds, and then a bell rings. On to the next date. Events like this are usually aimed at young professionals — until now. Speed-dating events for seniors are slowly cropping up across the country and, spoiler alert, they’re a huge success. Speed dating typically conjures images of big cities and millennials, but as Phillips is learning, it might also be a unique fit for senior citizens. She’s organized five speed-dating events for seniors in her community so far, with more planned for November and December. People are living longer than ever, and many are realizing that romance doesn’t have to stop with old age. 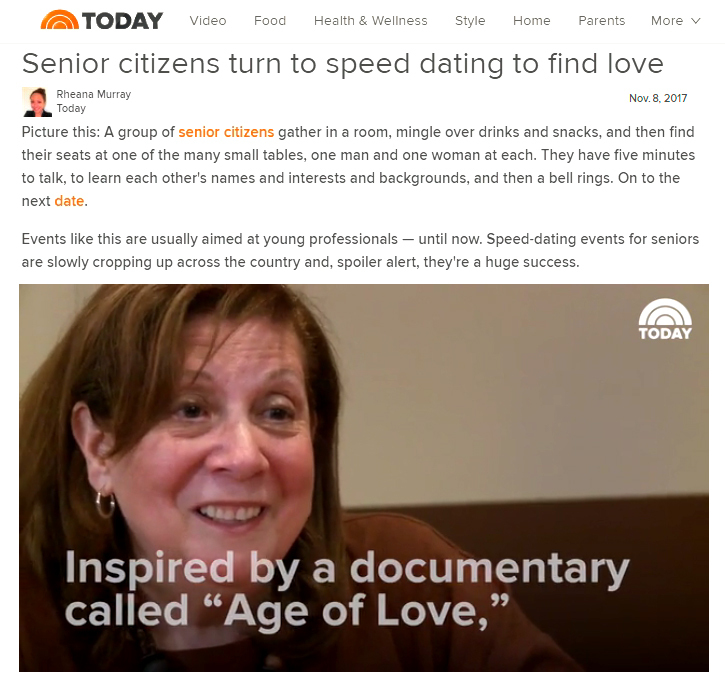 People in their 80s and 90s crave love just as much as the rest of us, explained Steven Loring, whose 2014 documentary “The Age of Love” follows a group of senior citizens in Rochester, New York, as they embark on a speed-dating adventure with hopes to find love, or at least companionship. Loring provides speed-dating kits to senior centers and communities that screen his film, with instructions for how to host their own event. So far, he’s given out 200 kits, although many of the events he’s heard about are one-offs, he said. But in Portage, Phillips appears to have tapped into something. The first event, in July, was a hit, and there are currently about 85 women on the wait list. (Men are harder to get involved, she said.) A restaurant hosts the events, and they’re open to the general public, not just members of the senior center. Phillips and her staff have already witnessed dozens of love connections: There’s the couple who met at a restaurant for their first date and talked for hours until they realized they’d forgotten to order dinner, and the man who had to undergo a sudden open-heart surgery weeks after meeting someone: “His girlfriend came in and said, ‘I am so glad we met, because that would have been a very lonely experience for him to go through,'” Phillips said.